The mission at PRIME Fitness has always been the same. We aim to make world-class, science-forward strength training equipment. What does that mean? It’s pretty simple, it means we are committed to using science to relentlessly drive the innovation of better, smarter strength training equipment. 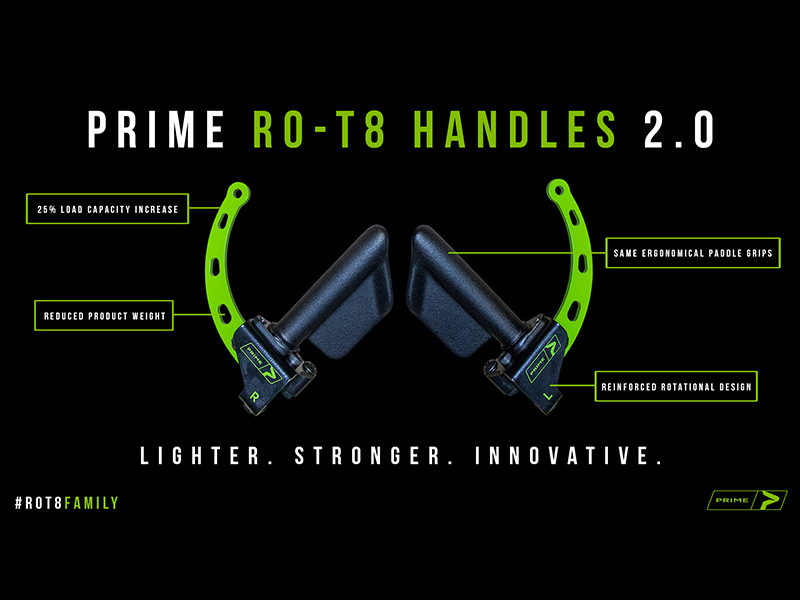 There may be no better tangible evidence of this than the recent launch of the PRIME RO-T8 Handles 2.0. Since the launch of PRIME RO-T8 Handles in 2016, we have seen a dramatic growth in the demand for the handles with each passing month. The response on social media has been unbelievable, we are so thankful for each of you that take the time to share them. While we are thankful for the success of the product, we knew we could make them even better. So we did. We made them stronger with a 25% increase in load capacity. We made them tougher with a more rigid rotate design. All of this while shaving nearly 10% off the combined weight of the handles. For all of you who follow PRIME, support PRIME, promote PRIME… We can’t thank you enough. Your positive messages and encouraging comments are what keep us pushing forward on our mission to smarter strength training equipment. Also, for all of you that have a pair of the original RO-T8 Handles, don’t stress, the biomechanics of the RO-T8 2.0 Handles are the exact same, so you still have the most effective and versatile handles in the game!